These definitions of the local computer are used to adjust it to Hyper and its requirements, in order to make its functions available for the organization's users. POS Station ID If the local computer is used as Point of Sale station (with a cash desk), the POS number should be defined in this field. In the "POS Agency" field, select the agency from the list. The agency number is used for identifying the agency that produces the invoices and receipts, in order to relate the accounting activity to this agency. POS Agency Select the POS Agency from the list. If this is not a point of sale computer, choose this option from the list. Purchases and transactions of the casual customers. Every transaction will be added to this customer's card. Phone calls that could not be related to any other client in the system. Local Barcode Reader Prefix (Hex) Define a prefix of a barcode, for exceptional products that will not be calculated in this POS. Local Barcode Reader Suffix (Hex) Define a suffix of a barcode, for exceptional products that will not be calculated in this POS. Print Sale Docs on Thermal 80mm Select a default 80mm printer for printing receipts. 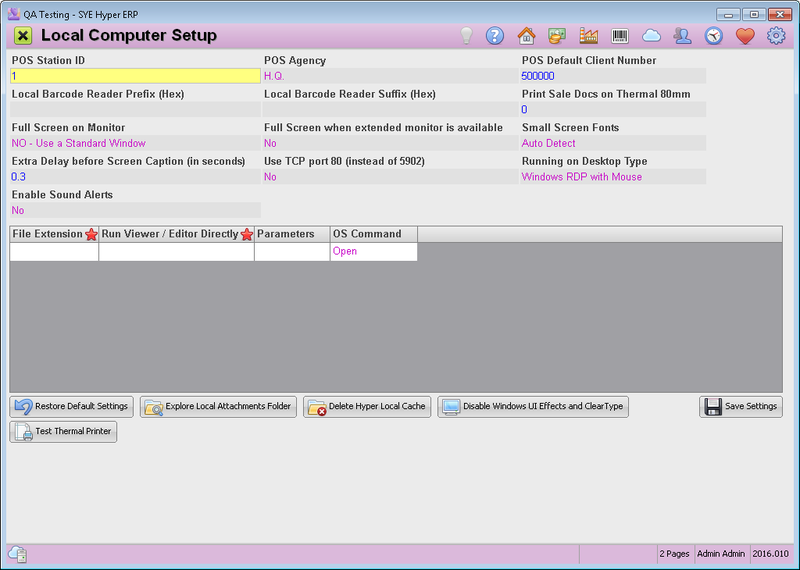 The system automatically recognizes the connected printers and display a list of the available printers. If no printer is selected from the list, the system automatically uses the defined default A4 printer. Full Screen on Monitor Select the required monitor from the list, to display Hyper in full screen mode (without the top Windows Toolbar). Full Screen when extended monitor is available Choose whether to display Hyper in full screen mode when extended monitor is available. Auto Detect - Automatic adjustment of the fonts to the user's screen resolution. Small Fonts - Use small fonts anyway. Normal Fonts Anyway - Use normal fonts anyway. Extra Delay before Screen Caption (in seconds) Hyper allows to execute a screen capture. Since some of the operating systems have filters and effects when opening windows, this action can fail. Therefore, Hyper allows to define an extra delay before executing the screen caption, in order to allow the system to execute the effect and then capture the screen caption. Use TCP port 80 (instead of 5902) As defined in Hyper's installing process, port 5902 id the default port while port80 is the available alternative. If there is any problem with port 5902, use this field to define port 80 as the default port instead. Running on Desktop Type Select the relevant desktop type from the list, in order to adjust Hyper to its definitions and properties. Enable Sound Alerts Activate Hyper's sound alerts. Use this table to define a default external programs for opening files according to their extension. File Extension Select the required file extension from the list. Run Viewer / Editor Directly Choose the location and path of the required program for opening the files with the selected file extension. Parameters If there are any required parameters for opening the program, fill in the parameters in this field. OS Commands Select the required authorization for these files. Open - Open the file in "Read Only" mode. Edit - Open the file and allow to edit and modify it. Please note - Some of the programs may not allow to edit the files, due to these programs definition. In this case, try to change this field authorization to "Open". Restore the above settings, according to the last saved definitions. Open the local attachment folder of the user. Each loaded file is saved due to future efficiency considerations. These files are deleted after defined period of time but can be proactively deleted at any time by using this button. The files are being saved in the following path: Program Users/Username/Appdata_local/Sye_cache. Disable the effects of windows. The above definitions are the .ini file definitions of Hyper.